Historic Denver mansions that have been converted to office use are becoming increasingly desirable as downtown rents rise, for-sale buildings become ever more scarce and more people want to control their own real estate. 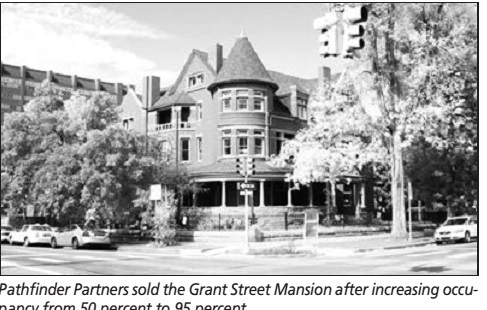 Pathfinder Partners just sold the historic Grant Street Mansion, which it bought in foreclosure three years ago and boosted from 50 percent to 95 percent occupancy. Although mansions comprise a small, niche market, brokers who deal in such gems of Denver history say they are seeing an uptick in demand. “They really play off Class B and C buildings,” said Tim Finholm of Unique Properties LLC-TCN Worldwide, who represented Pathfinder in its sale. As rents for those products increase downtown, tenants are likely to consider locations in and around Capitol Hill, where rents are lower and they may not have to pay for parking. “If they’re going to lease, mansions usually are about $3 to $4 less a square foot than what they could get downtown, and you don’t have the hassle of going downtown,” Finholm said. Also, more people are l o o k i n g to buy their own buildings to build wealth and control their company’s costs. “A pure office building is almost impossible to find in Capitol Hill, for example,” said Stockton Baker of Cassidy Turley. “I think tenants really want to control their own rent increases in the years to come as landlords continue to push rates up not only in Capitol Hill but in downtown and Cherry Creek,” Baker said. In 2008, mansions were selling for around $80 to $100 per sf; prices today can be $135 per sf or considerably higher, depending on layout, parking and other factors, said Finholm. Baker has the Brind Mansion, a 9,168-sf building at 825 Logan St., listed for lease, or for sale at $1.78 million, or $193.60 per sf. Finholm and Unique Properties’ Sam Leger sold the Chittenden House, an 8,863-sf mansion that was completely redone by architect Curtis Fentress, earlier this year for $2.13 million or $239.76 per sf. The 19,422-sf Grant Street Mansion at 1115 Grant St. traded for $2.65 million, or $136 per sf. It was built in 1892. The original owner was Dennis Sheedy, a successful Denver businessman who managed the Denver Dry Goods Co. and had dealings in banking and mining, according to the Denver Public Library. Designed by noted architects Erasmus Theodore Carr and William Pratt, the mansion features Victorian, Queen Anne-style architecture with ornate embellishments, milled woodwork and quartersewn oak. The four-story building, which comprises approximately 16,000 sf, has 28 office suites. There are three additional suites in a 4,000-sf carriage house. “We recognized that th Grant Street Mansion was an irreplaceable property located in an outstanding Denver neighborhood known for its combination of historic charm and cosmopolitan ambiance. Capitol Hill has undergone a significant gentrification, spawning an influx of new businesses, restaurants and young, hip residents,” said Lorne Polger, P a t h f i n d e r senior managing director. M a n s i o n s aren’t for everyone. “It takes a unique person,” said Finholm, noting buyers have to appreciate the history and uniqueness of the asset, and typically fall in love with when they walk in the door. That certainly was the case for Ayuda Management Corp., whose owners bought the Chittenden House. “They just fell in love with the historic mansion, the fact that it was completely redone,” said Trent Rice of NAI Shames Makovsky, who represented the buyer. The owners wanted to own vs. lease, so, “It just fit really well for them,” he said. Owning a historic structure often means higher operating expenses and taking on a certain amount of unusable space, with back staircases and inefficient floor plans, for instance, said Finholm. In addition to improving existing suites, landscaping and security, and curing deferred maintenance, San Diego-based Pathfinder Partners turned a former residential unit and a kitchen at the Grant Mansion into three office suites and reconfigured other suites to make them more functional.